Why should we care for humanity's artistic patrimony? The beauty of a painting done hundreds of years ago nevertheless still has the power, even today, to move us by the love and dedication with which the artist painted it, whatever the subject and the manner in which it portrays the spirit and the feelings of his times. All the more reason to preserve our artistic patrimony A work of art be it by a well-known artist and signed and dated or by an anonymous provincial artist can never be replaced should it be destroyed or lost. Artist�s materials, the colours, the brushes, his canvases eventually decay, the process already having begun even as the painting left the artist�s studio. A painting can deteriorate slowly and steadily or rapidly in a short time. The painting's location, seasonal changes, the climate, including temperature and humidity, all contribute. Harsh summer sun fades the colours of paintings and watercolours not protected from direct sunlight. Paintings on timber can split and the paint layer itself blister and flake where changes in temperature and humidity are too sharp. Some paintings hazards are entirely self inflicted. A hanging framed oil painting should be checked to ensure that the hook, wire or rod from which it hangs is itself securely fixed into the wall. They are checked regularly to ensure that the wire is not wearing too thin. Should wire degrade and work free it can take the painting with it. The preferred hanging techniques include stainless steel or copper rods. The damage that an insecurely hung painting receives should it fall from the wall is minor compared to the collateral damage. Painting always seem to hang above piece of furniture, bronze statues or other sharp-edged objects. A delicate and ancient canvas under tension encased in a heavy carved timber frame is a massive dead weight. Its fall onto a sharp object below will magnify any other damage tearing holes in the painting and ripping parts of the canvas from the frame. Paintings can be glazed using either glass or sheet acrylic although clear glass is normally preferred. Acrylic has a softer surface and it is liable to collect scratches that quickly become noticeable. Acrylic is also somewhat static and so, attracts dust on both the inside and outside surfaces. The dust can eventually damage the painting. 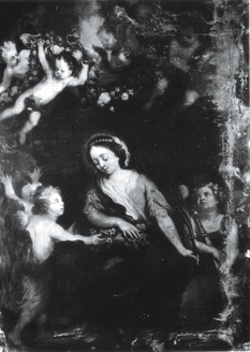 Dust, humidity and ultraviolet light can quickly change and fade the colours of paintings. Where at all possible, and, especially in the case of watercolours, glass is used that has been specially treated to filter out ultra violet light. It is designed to block 95% of harmful U.V. radiation and prolongs the life of oil painting by slowing the work of art�s natural decay. The picture owner who needs to, can obtain conservation advice by contacting almost any public art gallery. Museum curators welcome the opportunity to examine, even modest, oil paintings and can suggest the best methods to frame, to hang and to illuminate the painting. These professional suggestions are extremely valuable, help prolong the parting�s life and increase the owner or collector's enjoyment - and the advice will be free. Art conservation has developed because of our more focused concern for the preservation of our paintings patrimony. The conservator can, for example, remove a dark varnish that conceals the beauties hidden beneath. The procedure allows the art lover to enjoy the newly revealed colours of an Old Master. Old paintings on canvas, because of their fragility, are easily damaged. The artist's canvas can rip and tear easily, have holes punched in it or, where the painting has hung in a damp location, the edges may rot and fray from the frame. One of the paintings conservators tasks is to replace the damaged canvas. Lining is the name given to the process of backing the painting onto a new canvas. Lining preserves the painting and extends its life. A painting on wood hanging in a badly controlled ambient with too high humidity or excessive dryness may warp and split. The painting itself becomes unstable and subject to flaking. It may also be attacked by termites. Occasionally, when an Old Master painting is reduced to this state the conservator will remove the entire original timber support from the paint layer. Where possible, the panel is saved from further degradation by specialized conservation and the paint layer put back on it. In the rare circumstances where the support is not savable the paint layer is attached to a new backing. Repairing a do-it-yourself picture cleaning that has gone wrong is the most difficult restoration problem a conservator is asked to handle. Amateur picture cleaners are usually the guilty parties but otherwise conscientious museum professionals, who however, lack conservation qualifications, do sometimes attempt the delicate operation of cleaning works of art. The results can be fatal. The amateur picture restorer keeps cleaning until the paint starts to disappear beneath his cotton swabs and solvents. When the canvas appears from beneath the paint layer, the amateur feels that it is time to stop. Long before then he has damaged the painting beyond recovery. It is very easy for the amateur picture restorer to unintentionally destroy the delicate surface of a work of art, that part of the painting where the artist applies the tints, glazes and his signature, the final touches. The Old Masters glazed over lower paint layers using transparent colour. It gave an added depth and richness to his finished painting. These tints are the fragile final layers and contribute the most to distinguishing a work of art from a run of the mill painting. The conservator will try to limit the damage caused by previous over-cleaning (skinning) but will never be able to replace the original painting once it is gone. The art of conservation allows us to preserve and enjoy the beauty of works of art passed down to us by our cultivated ancestors. It makes it possible to hand on the same painting to future generations of art lovers who will, in turn, have the chance to cherish and enjoy them also. Need a one-time evaluation of an old oil painting in your possession? Click here.